Our famous thief... er, um, treasure hunter, is back to try again! Super Dangerous Dungeons has some old, some new, and a much tighter control system that will have you rage quitting purely because of the difficulty and not any flighty controls. The "third" in this small series is not really a sequel to Tiny Dangerous Dungeons, but more like a version 2.0 of the original Dangerous Dungeons. Adventure Islands' new action puzzle platform game is a solid improvement on the first with just enough tweaking that even the levels that taken from the previous game are different enough you'll notice. Work your way through the dungeons using only the right and left [arrow] keys and your steady jump that goes higher the longer you hold the [spacebar]. Get the key and then get to the door to go deeper into this dungeon. Race against bosses to win the treasures and do everything you can not to die. With new levels spread throughout you'll be happy to know as well that this high difficulty challenge can go with you wherever you go as it's also for iOS and Android. So now you can find secrets, collect treasure, and rage quit all to your heart's desire while waiting in line or, let's be honest, sitting on your porcelain throne. 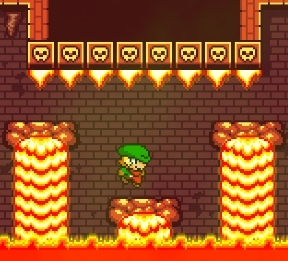 The only bad thing Super Dangerous Dungeons does is put its ancestor to shame. Its cleaner with the gameplay and did away with some things that weren't the most fun, like not being able to see where you're going on the water levels and therefore dying a few times just to figure out where to go. All that being said, if you haven't heard of the first game, it was actually well-received and rated quite high and definitely worth a try or two (or twenty). Which just goes to show how great this one is. However, you'll probably quickly notice that though things are improved with Super Dangerous Dungeons, this one actually feels a lot easier. So those who loved the stark challenge may be a little disappointed. The struggle to win is still there and with no option for checkpoints this time around your safety net from before is gone. But you won't be rage quitting quite as much as the previous game. Keeping with the secrets from before you'll have to find all the treasure if you want to win this game. I mean any real thei...treasure hunter would never leave any goods lying around. OK, where's the durn secret in world 1??? Behind the saw blade that chases you around. Hide in the nook on the right, after the spears, then go back. OK, I get the point, but really: Checkpoints. C'mon, man. Checkpoints. It plays better than the last one: no untimely stuttering that would cause me to miss or overshoot jumps. This game is actually so easier that you forget there were checkpoints in the previous one. I suppose the real challenge would be playing this on a touch device with nonzero input latency, as I had absolutely no problems with it in pc web browser. Story-wise, it's not a true sequel but a re-imagining of the first game. I seem to get a lot of freezing during play, anyone else getting this in chrome? I didn't have any issues in Chrome. Not to say Chrome hasn't done that to me before. Usually flash crashes and i reset it and then things go smoothly again. In level 6, the secret area is where the saw comes out. In level 18, go onto the button on the bottom-left and go left. In level 25, when you get the key, go up the broken platforms. In level 36, instead of getting the key after you flip the switch, go to the platforms above to go into the hole the platforms go.